Cut cardboard tube into 1 ½” lengths. Place one of the tubes onto the red felt and cut the felt just slightly wider than the tube. Wrap the felt around the tube and trim off the excess, leaving enough for a small overlap. Glue the red felt around the cardboard tube. Cut a strip of black felt, about ½” wide, and glue it around the red tube, lining up the seams. Cut two strips of white felt, about ¼” wide and glue them around the edge of the cardboard tube, overlapping the edge a little. Cut a 3” piece of gold chenille and bend it into a square for the buckle. Glue the buckle to the black felt, be sure that the seam is on the opposite side. Let everything dry completely. 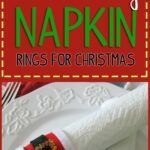 This project for Santa's Belly Napkin Rings was printed from CraftsbyAmanda.com - https://craftsbyamanda.com/santas-belly-napkin-rings/ and can only be printed for education or personal use.